Why is Ip Man a Role Model? Donny Yen reprises his role as Ip Man. Is this “Ip Man” your role model? It would be wrong to note that the Ip Man who exists in the public consciousness is an artistic creation, an invention of the entertainment industry, and simply dismiss the question out of hand. Obiwan Kenobi, one time general of the Clone Wars and Jedi recluse, is also a fictional character. Yet he continues to be cited as an inspirational role model by generations of movie goers. When it comes to role models, their tactile reality may be less important than the functions that they perform. As so many others have noted, Obiwan is an almost perfect “initiatory figure.” He shows no sign of fading from discussions of youth role models just because he is fictional. Ip Man as imagined in “The Grandmaster” (2013). Is this “Ip Man” your role model? Still, not everyone who is respected is accepted as a role model. In the United States presidents are generally respected, yet the partisan nature of the political system tends to excludes modern leaders from the ranks of universally accepted “role models.” Likewise on a university campus the president is always a respected figure, but empirically speaking students are much more likely to cite their own professors as role models, or individuals who had a transformative impact on their lives. The idea of a “role model” has so completely penetrated popular thought that we often forget that it is in reality a (contested) sociological theory attempting to explain certain aspects of youth socialization. This term was coined by Robert Merton, an important professor of Sociology who spent much of his career at Columbia University in New York City. One of Merton’s critical realizations was that initiates did not necessarily have to belong (or have expectations of belonging) to the reference group in order to be influenced by its presence. Broader social structures that linked these players and transmitted expectations turned out to be the critical links. It is these structures that both open the possibility for, and demand the acceptance of, an entire range of new behaviors and identities rather than just the adoption of a single role (in this case becoming a medical doctor). A reference group or role model helped to demonstrate this more complex set of social relationships. Yet what makes someone an effective role model is precisely the fact that they are in some ways quite different from the individuals who are observing them. If we are discussing an instructor passing on purely technical skills, it may be helpful to have two individuals with similar backgrounds so that the student will be confident in their ability to also perform the task at hand. In the case of a role model the specific things that they do take a back seat in importance to how they go about doing them. Or more specifically, how do they relate to other individuals and social groups in the performance of these skills. This is where identity, rather than just technical expertise, is demonstrated. Of course the idea of “difference” is central to discussions of role models and identities in the Asian martial arts. Adam Frank explored the question of how racial and national identity affected the transmission and transformation of martial practice in his volume Taijiquan and the Search for the “Little Old Chinese Man”: Understanding identity through the martial arts. It may be worth considering how different preexisting social categories affect Ip Man’s availability as a role model. As we saw previously, within the primary community of his own Wing Chun clan in Hong Kong during the 1950s and 1960s, there can be no doubt that Ip Man functioned as a role model for his younger students. In his accounts of life during the early years of the school, Chu Shong Tin has noted how the older Ip Man, who received a traditional education in Foshan before attending an English high school (or college) in Hong Kong, appeared to be the epitome of the traditional Confucian gentlemen. Displaced young men in Hong Kong, or simply those wrestling with questions of what it meant to be “Chinese” while living in a rapidly changing city under foreign control, were drawn to the confidence and “Confucian glamor” that he radiated. In Ip Man these individuals found a role model for the performance of (one version of) traditional Chinese values and identities in the modern world. This image led to the development of certain expectations that went well beyond the presentation of Wing Chun as a fighting system. When it was revealed that Ip Man was involved with another woman (other than his wife) during the 1950s many of his students took this to be a serious breach of their conception of “martial virtue” as well as their expectations of how a traditional gentleman should behave. In point of fact the “traditional gentlemen” who inhabited the world of Ip Man’s youth took second wives with some frequency. Still this rupture in expectations hurt his ability to act as a role model. Many students left during this period. This brings up one of the many issues that surround the question of role models. In technical terms such an individual is valuable because they demonstrate a new set of identities and social relationships that the student feels compelled to take on. They act as initiatory figures in the ritual of life. Yet as a society we tend to place unrealistic demands on our role models. We want our youth to be exposed to only the most exemplary behaviors. This is the trap of the modern celebrity role model. Youth turn to celebrities (often in the sports and entertainment industries) as they are exemplars of both social and material success. The fact that their image is distributed through various mass marketing campaigns also makes them readily available for different sorts of appropriation and manipulation in youth culture. Unfortunately the personal lives of many of these celebrities seem almost calculated to give parents and teachers heart burn. Actors and athletes are more often chosen for their unique professional qualifications rather than their ability to model the set of values (usually quite puritanical) that we wish for our own children. Nor is it always wise to delve too deeply into the biographies of your childhood heroes. Accusations of drug use swirl around Ip Man’s career. Opium was commonly consumed within elite social circles during the Republic period and Ng Chung So’s school (frequented by Ip) was said to be in the back room of a local opium den. Some of Ip Man’s students have also accused him of using drugs (either opium or heroin, accounts differ) later in the Hong Kong period as well. The historical reliability of these accounts is questionable. Yet when thinking about someone’s value as a “role model” reality is much less important than perception. The current popular wisdom which will quickly be encountered by anyone researching the internet for details of Ip Man’s life is that he was a drug addict. There are other stories about his career which, while not damming, do not easily fit into the sorts of exemplary modes that we wish to see our children emulating. While the Ip Man of the big screen is clearly meant to be a hero, the historical figure was vastly more complex. It is not uncommon to encounter on-line discussions in which certain darker elements of his life story are held up as reasons to stay away from Wing Chun, or at least his organization. Socially speaking we seem to reserve a special place in hell for (often reluctant or unwitting) role models who disappoint our expectations. Nor is Ip Man alone in this. The one fact that has become abundantly clear as I have researched the lives of many Republic era martial artists is that while most of these individuals had very admirable traits, few of them were saints. All of them were complex people with multifaceted lives. Ip Man’s recent prominence seems to have attracted a certain amount of negative attention that more obscure figures are often spared. Still, it raises questions of who could function as an effective role model in the current social environment. Answering this last problem requires that we be willing to refocus our analytical lens on our own motivations. American society is marked by a certain sense of restlessness. In different times this has manifest itself in a variety of ways from the drive for independence, to the Jacksonian push to overthrow social restrictions, to “manifest destiny” as the country pushed west. We seem to be a people either geographically or socially on the move. China (and by extension Chinese martial culture) has played an interesting role in all of this. So often it has become the “metaphorical other,” the foil against which we have defined our conception of self. As John Rogers Haddad points out, Chinese tea, served in blue and white porcelain bearing images of a wistful oriental landscape, were some of the only trade goods to be found in the majority of American homes from the middle of the 18th to the early 19th century. Even more interesting to consider is that in an age before mechanical reproduction, when few newspapers had illustrations, the images of an idealized Chinese landscape found on these willow ware dishes was often the only pictures that one could find in the average American home. Is it any wonder then that when so many Americans dreamed of an escape from the drudgery of daily life it was to China (or more precisely the quasi-imaginary and mystical land of Cathay) that their minds flew? Later in the 19th century with the advent of steam ships and rail roads (and the violent opening of both China and Japan by western imperialist) the dream of travel started to become a reality. Of course it was only a reality for the fortunate few. Most people remained tied down by work and family and commitments, and could not afford to spend six months on a grand tour of Asia. Yet in an era when the restless American spirit found its fullest expression in exploration and wanderlust, there was immense interest in those who could. Haddad notes that the late 19th century, as a new round of western colonization was encircling the globe, was perhaps the only time in which travel writers became universally acclaimed national celebrities and role models. Within the printed pages of their journals middle class readers found entertainment, often dressed as educational expositions, in the vicarious voyages being mass produced by various newspapers and publishers. Bayard Taylor became a national celebrity after the publication of series of letters detailing his journey up the coast of China and then to Japan (with Admiral Perry) in the 1850s. Lacking any form of scientific or geographic training Taylor relied on the art of analyzing faces and heads (popular in the 19th century) to divine the true nature of the communities who he encountered. His judgments on Chinese society (then wracked by the Red Turban Revolt in Guangzhou and the Taiping Rebellion in Shanghai) were devastating. In China Taylor found a people who were prone to disorder, vice and violence. Apparently he made no allowances for the fact that the people he encountered were largely refugees from the most devastating civil war in human history. The Japanese he judged to be intellectually curious and progressive, a nation to be watched with empathy and great interest. Taylor’s judgments helped to pave the path for the late 19th century Exclusion Act which barred Chinese immigration to the United States. They also seem to prefigure a long standing pattern in the role that China and Japan would play in the popular imagination. While America would go on to fight a bloody war against the Japanese, the public has always had an easier time accepting their aesthetic and cultural values. In the 20th century China, while still exotic, remained tinged with the perception of disorder and violence. During the post-war period Americans were once again struck with wanderlust, yet increasingly it was the internal world to which they turned their attention. The exploration of the mind and the unknown kingdom of “personal potential” became major themes during the 1960s and 1970s. This quickly became bound up with the growing interest in Asian culture and art which was evident in many quarters of American society, from the 1950s veterans of the Japanese occupation to the counter culture movements of the 1970s. At this cultural moment the ascetic discipline and philosophy of the martial arts became linked to the exploration of the self through altered states of consciousness. Here was a method by which practically any individuals could experience their body and senses in new ways, doing things that they had never previously thought possible. While all of this is certainly true, it is also worth pointing out that what drove a peasant to join the Red Spears in 1928, or a teenager to study Kung Fu in Hong Kong in 1958, differed in important ways from the motivations of the average American in 1978. Here we see the wide scale adoption of Chinese physical culture as an expression of distinctly western political and social impulses. Still, if one is going to radically transform the self, a “reference group” is necessary. If one is going to unlock the potential of altered states of consciousness, a guru or initiatory figure seems to be an essential part of the process. And if one enrolls your child in martial arts classes in the hopes that they will gain confidence, self-esteem and discipline, the promise of an appropriate set of role models is mandatory. 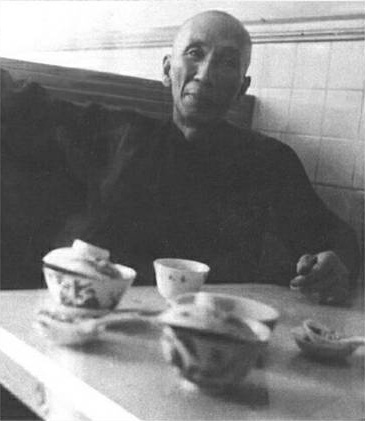 A rare shot of Ip Man enjoying a cup of Kung Fu Tea. Is the historic Ip Man your role model? All of this brings us back to our opening question. Why is Ip Man a role model? The most immediate answer is that certain communities have decided to promote him as such because his public image has become closely linked with a set of social values that they hold. Still, it should be noted that not all of these communities share the same ideals. The Confucian behavior that was so important to his students in Hong Kong in the 1950s would likely go largely unnoticed (or unidentified) by his great-grand students in America today. On the one hand it gives you the conceptual tools and research skills to really delve into subjects of interest. Yet in some ways it makes the enjoyment of popular culture more difficult. After studying economics one sees market failures on every trip to the grocery story. Feminist theorists discover an unending stream of gendered discourses in every new television show, and historians can be very difficult people to watch movies with. Graduate school might make you smarter, but I am not sure that it makes you any happier. On a fundamental level I am not really sure how useful the idea of “role models” are for understanding how new identities form. This was a concept that arose in the context of a specific theory and its ultimate value is something that sociologists and psychologists will have to determine. I am more certain that trying to make martial arts masters easily marketed “youth role models” by reducing the complexity and nuance of their lives is probably a losing proposition in the long run. Still, I suspect on some level I do accept Ip Man as a role model. It is hard to admire someone who is absolutely perfect. One of the things that I find most interesting about him is that he is a very sympathetic figure. He was capable of being lonely and depressed, he had trouble sleeping and he loved nothing more than to watch building fires. His personal life was marred by constant disruption and frustrated expectations. Throughout this all Ip Man demonstrated a remarkable ability to endure, to go on and build a new life in the face of disappointment. In a way his life story is emblematic of what was happening throughout Chinese society. He was born into a landlord’s family at the end of the Qing dynasty, he came of age during the tumultuous Republic, weathered the Japanese invasion and finally witnessed the victory of the communist party. Each of these events redirected the course of his life in important ways. These changes also transformed the role of the martial arts within Chinese society. Ip Man had an opportunity to witness a period of immense social change. In every period he found a new way to live. Finally, in Hong Kong he drew on this accumulated wisdom to create a compelling vision of how Wing Chun could be transformed and promoted as a modern fighting system, one which would bridge China’s past and future. Ip Man was many things, some of them contradictory. He was both a pragmatist and an idealist. He valued traditional culture, yet he was a reformer within the world of the southern Chinese martial arts. When faced with change and loss he responded by putting forth a burst of creative energy. In his martial arts instruction he advanced a series of questions that his students are still exploring today. The pace of change and global transformation has not diminished since Ip Man’s death in 1972. If anything it has increased. Social dislocation and frustrated expectations are the inevitable results of these large scale economic shifts. What does one do when the dreams of past generations have lost their luster? Can greatness still exist in a world of diminished expectations? 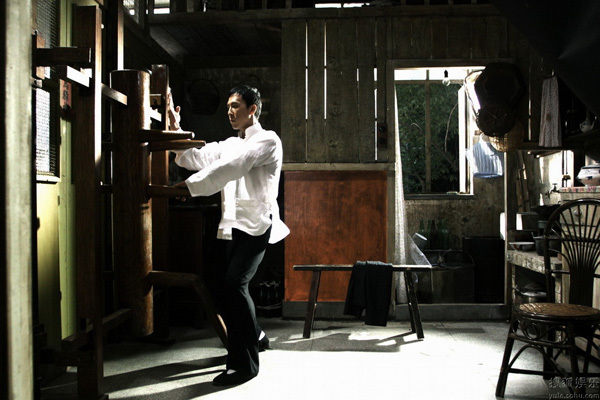 Ip Man’s life forces us to once again confront the central question, “What would you do?” In many ways he seems to be an ideal role model for the current age. If you enjoyed this post you might also want to read: Ming Tales of Female Warriors: Searching for the Origins of Yim Wing Chun and Ng Moy.